Have a quick look, sometimes papers like this are not available for long. I’ll try to hit the highlights here. The realization that low–glycemic index diets were formulated using resistant starch led to more than a decade of research on the health effects of resistant starch. Cool! This is a point I have been trying to make for about three years now. Researchers have known about RS for many years, but it never makes it into the mainstream. It seems to be kept hidden in research labs of food manufacturers. They are once again discovering RS as a “skinny carb” but as usual, the advice is all wrong! Reporting like this does nothing but make people look for RS on a label. I can’t wait to start seeing “High in RS” in the snack-food aisle. Fermentation of resistant starch in rodent studies results in what appears to be a healthier gut, demonstrated by increased amounts of shortchain fatty acids, an apparent positive change in the microbiota, and increased gene expression for gene products involved in normal healthy proliferation and apoptosis of potential cancer cells. Nice. OK, but what about humans? In human subjects, insulin sensitivity is increased with the feeding of resistant starch. But here’s the part that got me excited enough to write this blog. Researchers are finally seeing that gene expression may be more important than bacterial species populations! Later, our group performed a gene array for cecal cells to determine a more global approach on what gene expression is increased. proliferation, differentiation, and apoptosis, all likely tied in a complex manner to improved gut health. The most upregulated gene in the gene array was dualspecificity protein phosphatase, which responds to environmental stress and prevents oncogenesis [cancer formation]. And this is after eating RS2, from Hi-Maize corn starch, but it’s not a huge stretch of the imagination that all RS is equally healthful. …RS2 promotes apoptosis of precancerous cells but does not reduce cell proliferation of healthy cells. Cyclin dependent kinase inhibitor 1A promotes apoptosis of potentially proinflammatory cells. Several TNF receptors were increased, and, during binding of TNF proteins to TNF receptors, 1 of 3 pathways can be stimulated based on cell type and conditions. Deep, yes. Translation: RS2 was shown to interact with “Tumor Necrosis Factor” genes, killing cancer, but leaving healthy cells alive. …the high-fat diet reduced the formation of butyrate and increased succinate, inflammation, liver fat, and cholesterol. The dietary fiber only partially counteracted these negative effects. This graphic explains that as RS is added to the diet, in supplemental or whole-grain form, bacterial diversity increases and gut health increases. But we already knew that, didn’t we? Bifidobacteria may be too simple to be the only answer for a healthy gut. The genus Akkermansia was only discovered 9 y ago, and bacteria in this genus, particularly Akkermansia mucinophila, degrade mucin. Mucin serves as the carbon and nitrogen source for bacteria in this genus. They degrade N-glycans, and the gene-array study by our group demonstrated that galactose-4-epimerase, which catalyzes the formation of UDP-N-acetylgalactosamine from UDP-Nacetylglucosamine and represents the first committed step in mucin biosynthesis, was upregulated. This enzyme transfers an N-glycan to the oxygen of serines or threonines to produce O-glycans. These O-glycans promote the growth of favorable bacteria in the large intestine. Translation: Bifidobacteria are important, but so are other, newly discovered microbes, such as Akkermansia. Eating RS2 creates an environment favorable for all beneficial bacteria! 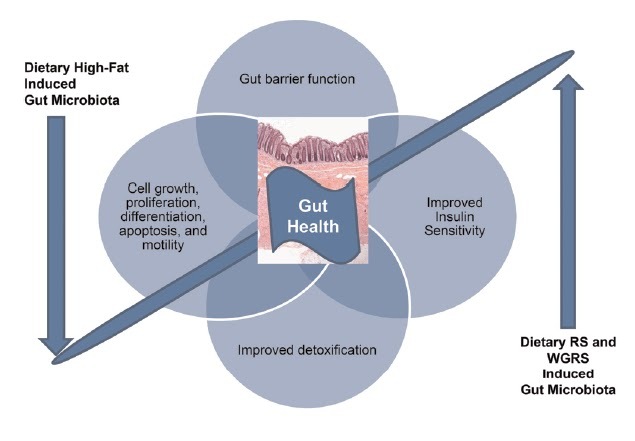 Many studies were performed with RS fed to animal models and demonstrated many health benefits, including increased fermentation leading to improved gut health, reduced adiposity, and improvement in insulin sensitivity. The major beneficial result observed in studies with human subjects is an increase in insulin sensitivity. 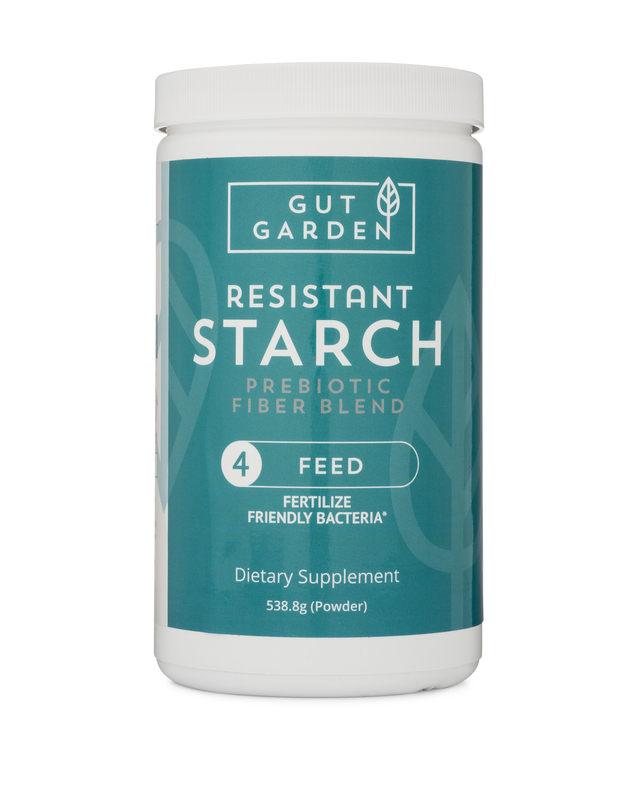 Most animal studies demonstrate an increase in the gastrointestinal tract incretin hormone GLP-1, but only 1 of the studies demonstrating improved insulin sensitivity reported an increase in serumRole of Resistant Starch in Improving Gut Health, Adiposity, and Insulin Resistance GLP-1. This may be because many humans who develop insulin resistance and type 2 diabetes have an ineffective allele for a transcription factor that is known to interact with the promoter region of the proglucagon gene and to increase its transcription. The mechanism for improved insulin sensitivity in human subjects in those who do not produce increased amounts of GLP-1 with HAMRS2 feeding is unknown at this time but likely would involve positive changes in the microbiota. Also, very encouraging is the study in obese-prone rats that observed reduced body fat with 8% of the weight of the diet as HAMRS2. This result may mean that humans could reduce body fat if the recommended amounts of dietary fiber are consumed, including a variety of fermentable fibers. There you have it folks! The hamster studies are valid. RS2 is a great prebiotic. 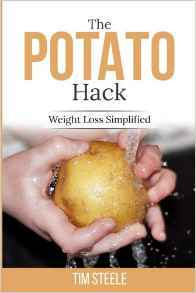 Later this summer there should be an interesting research paper where humans were fed potato starch and their gut bacteria examined. As soon as it’s available, I’ll write a report. Until then…eat your fiber! If you want a good, cheap supplement, try some raw potato starch. 1-4TBS a day is a good amount. You, your gut flora and your genes will benefit!